The Lower East Side route of NYC Ferry by Hornblower will connect residents with job centers in Midtown, the Financial District, and Long Island City. *Supplemental vessels and departures may be added as demand necessitates. Weekday Schedule for lower east side ferry route. F Train between 21st St. and 41st Ave. 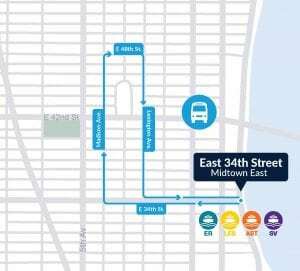 The midtown shuttle bus departs on a schedule from East 34th Street approximately every 11 minutes during the AM rush hours, and approximately every 23 minutes during the PM rush hours. ***At all pick-ups other than East 34th Street, the shuttle operates on a ‘Flag Down Service’ only. You may hail the shuttle like you would a taxi at any of the listed shuttle stops. Please note that shuttle operations are subject to traffic delays. NYC Ferry envisions a clean and clear future in New York City. Respect Our Planet is our adopted environmental program, in which we partner with other waterfront organizations to do volunteer work around the city as a way of giving back to the communities we serve. We promote environmental stewardship and through our efforts to minimize environmental impact we encourage staff and visitors to adopt green practices that will benefit the city of NY.